About 3 years ago I switched from the Lotus Development team to the Lotus Services (ISSL) team. Shortly after that switch, I developed an asset for a product then known as the Learning Management System (today it's IBM Workplace Collaborative Learning). The asset went on to be called LMS Data Loader. It provided a way for customers to bulk import learning data into their systems (e.g. enrollments, courses, users, progress data, etc). Customers loved it! Entering data manually was a huge pain in the *** and very time consuming! The asset was given for free to customers as long as they engaged ISSL for at least a week. Based on customer reaction, the development decided to include this asset as part of the supported software in the next release of the software. It feels great to know that something I developed on my own will now be in the hands of customers to use and leverage!!! As you remember from a couple of weeks ago, I talked about a new approach to integrate external applications (e.g. Connections, Quickr, etc.) with WebSphere Portal. This new approach uses a new asset developed by the Lotus CTO team. On Friday, this asset was presented to the Portal, Quickr and Connections communities. For those of you who already knew about Firebug, excuse me for being late to the party ;). 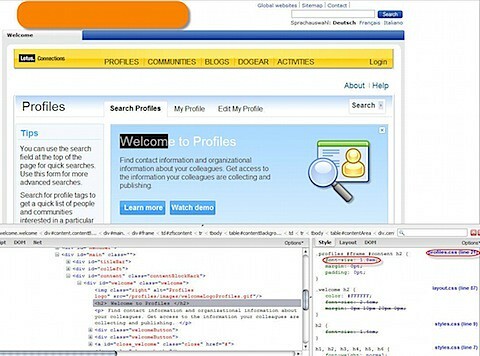 For those of you who do web development and haven't discovered FireBug, install it today! I had an interesting 2 hour meeting today with a Manhattan customer in the Education industry. So many new feature requirements came out of that meeting that I'm scared that if I log them all on the internal Feature Request site I will crash it! Can a drop-down be used for user to select tags instead of them entering it? Can an administrator control tags (i.e. Create, update, delete) ? Can taxonomy from WCM/Quickr be imported into Connections / Profiles? Can the profiles DB be populated from multiple data sources ? After I heard these, I thought we might be talking to the wrong people. Fixing the tags? Pre-populating them? Isn't this against the 'principles of web 2.0' ? Anyway, I said you could theoretically do that with services (i.e. pre-populate the tags table in the Profiles Database and then modify the UI accordingly). They also asked about usage reporting. This has been asked for before so I just told them it's coming in V2.0. Alternatively, we could do something with WebTrends, for example. Then we spent about 1 hour talking about Wikis and the lack of them in Connections. This is a popular feature request and therefore Wikis will be there in V2.0 as well! Anyway, they knew Wikis were part of Quickr. They, however, wanted Wikis as part of Communities ("and by February 2008"!!!!). I talked about the tighter integration between Quickr and Connections in Release 2.0 but that didn't do it for them. They wanted Wiki's to be part of Connections so that it would be part of the user's Connections Dashboard. In the end, it looks like services will have to write a whole new User Interface for Connections utilizing the Connections APIs. What's your experience with selling Connections to the traditional KM people? Seems like at this customer they still wanted to follow a very strict pattern and not leverage the 'freeness' that Web 2.0 provides.